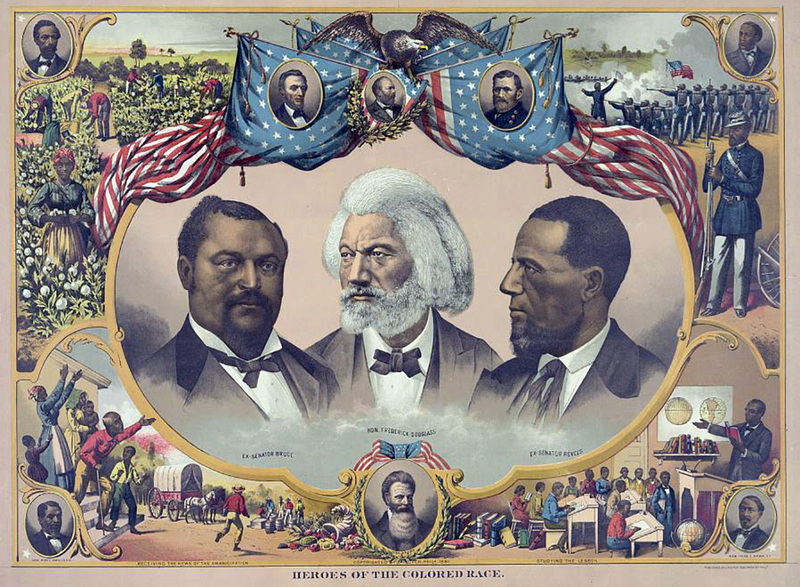 “Heroes of the colored race,” chromolithograph print published by J. Hoover (Philadelphia, 1881–1883). Frederick Douglass is flanked by U.S. Senators Blanche Kelso Bruce and Hiram Rhodes Revels and surrounded by scenes of African American life and portraits of John Roy Lynch, Abraham Lincoln, James A. Garfield, Ulysses S. Grant, Joseph H. Rainey, Charles E. Nash, John Brown, and Robert Smalls. Revels was the first African American elected to the Senate, to fill a partial term in 1871; Bruce was the first African American to serve a full term, beginning in 1875; both men represented Mississippi. Image courtesy of Library of Congress Prints and Photographs Division. Frederick Douglass didn't know when he was born. “I have no accurate knowledge of my age, never having seen any authentic record containing it,” he wrote in Narrative of the Life of Frederick Douglass, an American Slave. “By far the larger part of the slaves know as little of their ages as horses know of theirs, and it is the wish of most masters within my knowledge to keep their slaves thus ignorant.” Subsequent research confirmed that Douglass was born in February 1818, but (barring an unlikely future discovery) the precise date will forever remain a mystery. He celebrated his birthday on February 14 because his mother—who died when he was a child—called him her “little valentine.” For the entire month of February 2018, then, our nation is celebrating Douglass’s bicentennial, with events clustering around Valentine’s Day. After the publication of his Narrative, “the inevitable charge appeared that a slave boy could not have written the book,” writes historian William S. McFeely. “But anyone who had heard Douglass—and by 1845 thousands of people had—knew that the language of the Narrative was the same as that of the man who so passionately told his tale from the platform.” The same skepticism about authorship appeared when Harriet Jacobs published her own narrative in 1861. And, in fact, the novelist Lydia Maria Child was accused of being the “real” author of both Jacobs’s and Douglass’s memoirs. By the time of the Civil War, however, over one hundred slave narratives had been published during the previous century, and it was becoming increasingly difficult for critics to question their authenticity. Douglass was, without doubt, the most famous African American during the 1800s; he was also the most photographed American of the century, an advocate of “picture-making” as a “might power” that could be used to combat racist stereotypes. He wrote and published three memoirs (including the Narrative), one short novel (The Heroic Slave, based on the life of Madison Washington), and thousands of speeches and essays. Yet for most of his life he was best known as an orator: “He was considered by many the art’s exemplar, better than Lincoln and other statesmen,” writes John Stauffer (author of Giants: The Parallel Lives of Frederick Douglass and Abraham Lincoln), “and by the 1850s he commanded among the highest speaking fees in the country.” Douglass published many of his speeches in his own magazines and newspapers; at various times during his fifty-year career as a writer, he owned and edited four different periodicals (The North Star, Frederick Douglass' Paper, Douglass’ Monthly, The New National Era). Notes: When Douglass mentions in the opening paragraph that he lives “out West,” he is referring to Rochester, New York, his home from 1848 to 1870. Robert Toombs (page 8) had commanded a brigade in the Confederate army and served as inspector general of Georgia militia in 1864; Alexander H. Stephens was vice president of the Confederacy. Douglass claims that African Americans had the right to vote in “eleven States out of the old thirteen” (page 11). In 1787 black men were explicitly enfranchised in four states (New York, New Jersey, Pennsylvania, and North Carolina); those freed before 1783 could vote in Maryland; blacks were not explicitly prevented by law from voting in five states (Massachusetts, New Hampshire, Connecticut, Rhode Island, and Delaware). Only three states (Virginia, Georgia, and South Carolina) explicitly prohibited African Americans from voting. In 1814, during the War of 1812, General Andrew Jackson referred to white officers as “fellow-citizens” of the free people of color in Louisiana he asked to help defend the state against British invasion. Edmund Quincy, mentioned on the last page, was vice president of the Massachusetts Anti-Slavery Society from 1848 to 1860. I came here, as I come always to the meetings in New England, as a listener, and not as a speaker; and one of the reasons why I have not been more frequently to the meetings of this society, has been because of the disposition on the part of some of my friends to call me out upon the platform. . . . If you don't see the full selection below, click here (PDF) or click here (Google Docs) to read it—free!